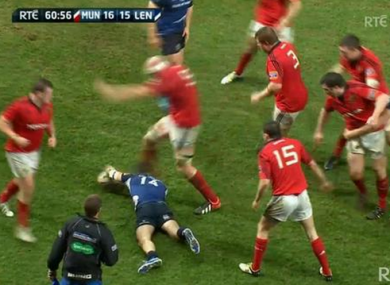 The former Leinster and Ireland lock condemned the Munster man for not expressing remorse after rendering his opponent unconscious. Paul O'Connell's kick connects with Dave Kearney's head. ONE WEEK ON but one section of the media is not willing to drop the Paul O’Connell/Dave Kearney head kick drop just yet. The Sunday Independent has published three stories, today, that deal with the incident, which occurred in the Munster v Leinster Pro12 match on 13 April, in detail. In the closing stages of the match, O’Connell shinned Kearney flush in the head as he lay prone on the Thomond Park pitch. Referee Nigel Owens took no action at the time and O’Connell rejoined his teammates as the winger was carted off the pitch. On Monday, the match’s citing commissioner, Eddie Walsh, deemed that the Munster man had no case to answer, prompting criticism from Leinster coach Joe Schmidt and captain Leo Cullen. Francis adds that ‘it is a given that there was no malicious intent in O’Connell’s action’ but criticises the forward for not expressing concern for Kearney, a player he has trained with in Ireland camp in the past. He believes a public act of contrition would reassure ‘every kid, red or blue, who witnessed what happened’. In Jim Glennon’s column, the former Ireland international stated that the lack of a citing sets a worrying precedent. Would the public and media reaction be quite as muted had it been Brian O’Driscoll or Sean O’Brien being carried off the pitch? One suspects not. Email “'Kearney could have been killed' - Neil Francis on O'Connell's head kick”. Feedback on “'Kearney could have been killed' - Neil Francis on O'Connell's head kick”.